Bringing home the bacon is easy if you have money and a store nearby. But even bacon can get boring. Florida hunters have a lot to choose from that can rival bacon in the tasty department. Following the rules, a good shot can bag alligator, Burmese python, deer, dove, duck, quail, and small game including squirrels, rabbits, possum, turkey, and wild hog. If you bag a python, you have to let the Florida Wildlife Commission know where and when within 36 hours of taking it. Email the information to ExoticReports@MyFWC.com. Hunters are encouraged to take and submit photographs of harvested pythons. There is a lot of eating on a big snake. Use your granddad’s recipe for rattlesnake and freeze what you don’t want to eat soon. Small birds are a lot less dangerous to get and will appeal to more people than snake— large or small. Here’s a recipe for quail that’s a bit different; still simple, but fancy enough for company. Pre-heat oven to 450 degrees. Rinse the birds. Dry with paper towels. Salt and pepper lightly. Sprinkle with freshly grated nutmeg. Melt the butter in a frying pan over medium heat. Add the chopped pear, and cook, stirring frequently, until softened, about seven minutes. Stir in the balsamic vinegar, and cook two minutes. Cool. Combine the pears, thyme and goat cheese thoroughly. Stuff each quail with the goat cheese mixture. Tie their legs together with butcher’s twine. Drape two halves of bacon over each quail, and hold them in place with toothpicks. Place the quail in a baking pan, and roast 25 minutes. Let the quail rest five minutes, then remove the toothpicks, and serve. The old saying “here today, gone tomorrow” doesn’t apply if you make jerky from some of your catch. But you have to be careful. Raw meats can be contaminated with microorganisms that cause disease. The harmful bacteria can breed faster than rabbits in moist, high protein foods like meat and poultry. You don’t want to know what can happen to your innards if the meat is not handled properly. If pork or wild game is used for jerky, the meat should be treated in order to kill parasites before it is sliced and marinated. Freeze in portions of six inches or less thick at five degrees F or below for at least 20 days. Freezing will not eliminate bacteria from the meat. 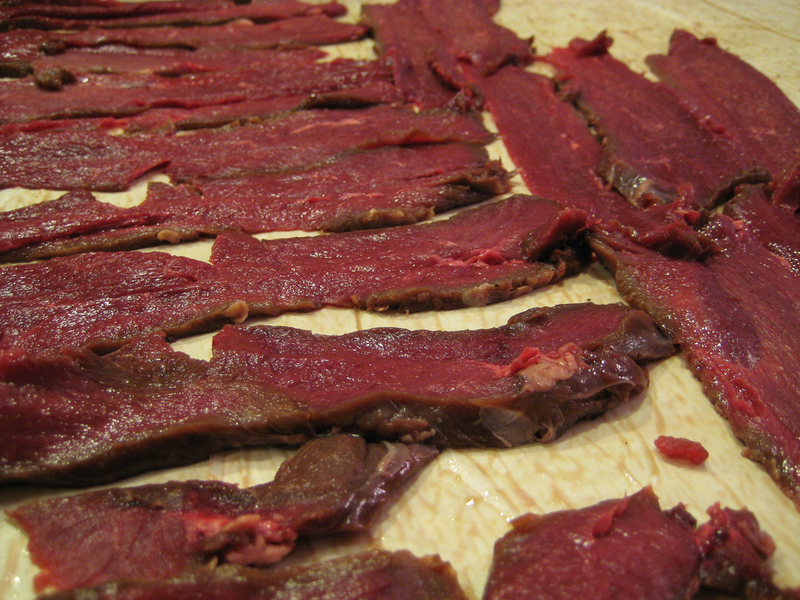 Making jerky is easier and more reliable than it was in the olden days, thanks to dehydrators. Follow the directions for time and temperature. Because you can’t be sure what’s in the wild meat you bring home, the USDA recommends boiling the meat in the marinade. Not everyone chooses to do that, especially if you know the source of the meat. Here’s a marinade that works well for venison. Combine ingredients. Place strips of meat in a shallow pan and cover with marinade. Chill two hours or overnight. The longer the soaking, the saltier the meat will be. If you heat the meat before drying to decrease the risk of foodborne illness, do it at the end of the marinating. To heat, bring the strips and marinade to a boil and boil five minutes before draining and drying. If strips are more than ¼ inch thick, the length of time may need to be longer. Check the temperature of the meat in the drier often and dry until 160 degrees. For wild hog, experts recommend soaking the meat in brine until it turns pale.